Got leftover bananas? Use them up in a delicious new way with these wonderful Thai banana recipes! Thai banana desserts are easy to make and wonderfully delicious. As a bonus, these banana dessert recipes are healthy, low-fat, low-calorie and completely guilt-free! (some are even gluten-free). ENJOY! 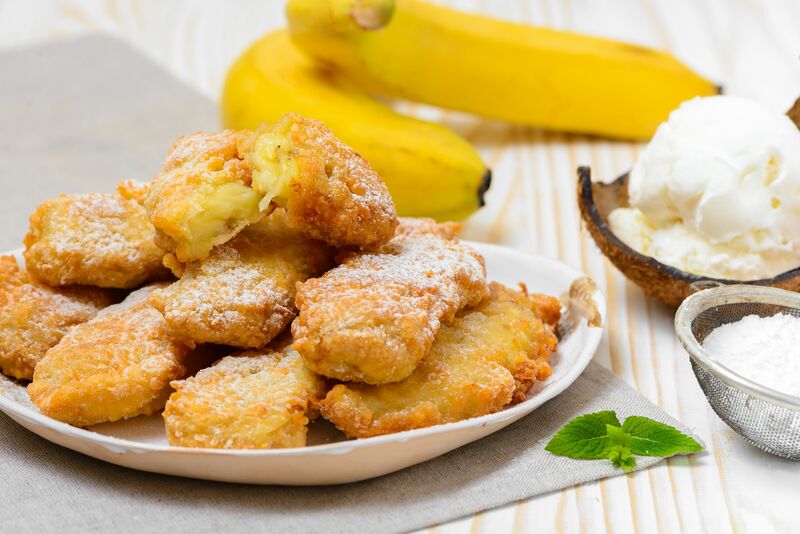 Fried bananas are a popular dessert and snack food in Thailand and throughout Southeast Asia. The dish is more often known as "Goreng Pisang" in Malaysia, Indonesia, Singapore, and surrounding countries. It's difficult to make fried bananas as good as those sold by street food vendors in Thailand and elsewhere - that said, I've been working on this recipe for awhile now, and think it's pretty good. Even my Thai and Singaporean family members have given it their stamp of approval! This easy dessert only takes 5 minutes to make! But don't be deceived by its simplicity - the taste is so wonderfully sweet and exotic that I find it addictive! It's also a low-fat dessert that happens to be incredibly healthy. A great way to use up leftover bananas, this banana lychee pudding is really more of what they would call a "dessert soup" in Asia. This simple banana lychee dessert recipe can be served warm or cold, depending on the weather and your mood (cold is great on a hot summer night while serving it warm makes this a superb comfort food). Enjoy! A terrific way to use leftover bananas, and you can put this easy dessert together in less than 10 minutes - just put everything in a blender and then pour into ramekins and pop them in the oven. Served warm, cold, or at room temperature, this creamy, tropical-tasting dessert is sure to please. This banana cake reminds me of a traditional British pudding in that it is a warm, moist cake combined with a sweet, butterscotch-like sauce. A great way to use up leftover bananas, plus it makes a scrumptiously good dessert! While in Thailand it would be steamed, it's easier to bake this banana cake in the oven. It's simple to make and healthy too - a gluten free cake everyone can enjoy. Use your leftover bananas to make this healthy dessert that is the Thai equivalent of bread pudding - but without the bread/gluten. Instead, glass noodles (made from protein-rich bean flour) are used, together with slices of banana and an easy custard. You'll enjoy this delicious dessert, especially when served warm with vanilla ice cream (or frozen low-fat vanilla yogurt). It's a delicious, comforting, low fat and gluten free dessert recipe that's also incredibly yummy! A common, naturally healthy dessert and snack food in southern Thailand, these banana rice cakes are wrapped in banana leaves and then baked in the oven (or barbecued, as in Thailand, if you have the right weather!). This Thai recipe is easy and fun to make - just pick up some banana leaves (fresh or frozen) and some sweet rice at your local Asian food store. The rest you should already have in your kitchen. This healthy and exotic Thai fruit salad will be the hit of your party - especially when served in a pineapple "boat" (a carved out pineapple). Create your own assortment of tropical and local fruit, including bananas, papaya, and pineapple. Serve with ice cream, whipped cream, or on its own for a fresh fruit feast. Carving instructions for the pineapple are included with the recipe - just follow the steps (with pictures).